Richard Strauss' Daphne at the Santa Fe Opera is a unique experience. The shepherds are coming in from the fields with their (live) sheep celebrating the end of day, and all around you the sun is setting. Daphne cries out for the day to stay just as the last streaks of light are seen on the horizon which spreads out around you. It's like nothing else. Erin Wall is glorious as Daphne. It is a soaring, ecstatic performance. The problem with this opera is that it requires two German tenors. Anyone who could sing Apollo well would already be rich and famous, and no one at Santa Fe seems to fall into that category. Scott MacAllister was out of his depth. Following in Wagner's footsteps, Strauss has cast the earth goddess Gaea as a true contralto with some pretty astounding low notes. Meredith Arwady was very deep and rich. The plot is not the same as the one I am used to. In Ovid the story has to do with a quarrel between Eros and Apollo. Apollo has insulted Eros' archery skills, so Eros shoots Apollo with one of his love arrows. Apollo falls for Daphne and a river god turns her into a laurel tree. There is no boy friend. It's not complicated enough for an opera plot. In the opera boy friend loves Daphne. Daphne doesn't like his love making techniques and rejects him. Apollo comes along to attend the bacchanal as a replacement for Dionysus and falls for Daphne. His love making technique is much better and she seems to be going for it. Boy friend is pissed and keeps wooing. Then Apollo is pissed and kills boy friend. 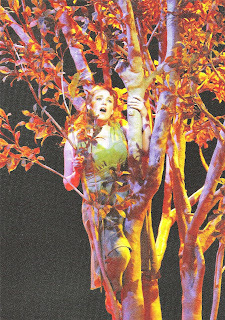 Daphne now misses boy friend and Apollo turns her into a tree. Very different. The bacchanal was staged as one might have imagined a true bacchanal, with choreographed sexual activity. This was pretty silly. Religion used to be so much more fun. We couldn't help wondering. The set for Daphne consists of a small slanted stage with a tree in the middle, a laurel tree, I presume. It stood open to the public for an hour before the performance began. The music started, the shepherds did their scene, and Daphne appeared from behind the tree. How did she get there? She can't have been there all along. She similarly disappeared at the end. It seemed to be magic. I am pretty much a Straussie and had a wonderful time.